HILLSBOROUGH COUNTY, Fla. — A full investigation by Hillsborough County will be conducted following disciplinary hearings on Tuesday for four fire medics accused of not taking care of a patient properly. 30-year-old Crystle Galloway died at Tampa General Hospital days after her mother, Nicole Black, drove her there on July 4. Black claims the fire medics told her she couldn’t afford the ambulance ride, which is why she eventually took Galloway in her own car. But the fire medics claim Black was insisting she wanted to drive her daughter to the hospital. A full review will help disclose the underlying reasons for the fire medics’ judgments and decisions as well as to determine any other contributing factors in this matter. In a statement from Mike Merrill, Hillsborough County Administrator said "Hillsborough County Fire Rescue must always deliver quality and effective emergency treatment consistently to any and all who seek it, and the review will aid us in determining proper and corrective action." “We stand by these paramedics. The paramedics also performed appropriate medical assessments of the daughter,” Donnelly said. Following Tuesday’s hearings, dozens of medics and fire rescue personnel showed to show their support for their four colleagues. “We are in this business to save lives. That's why we get into the business. We come to work to this fire rescue to save lives. The accusations against my four members are crazy,” said Derrick Ryan, Hillsborough Fire Union. “What shouldn't have happened is this county administration going on TV, condemning my folks before he had the opportunity to hear what they had to say,” Ryan added. Galloway had a c-section days before when she gave birth to her son Jacob Aden. The Hillsborough County Administrator admits the four fire medics that showed up to take care of her didn’t do their job correctly. "They didn’t take any vitals, they didn’t take any blood pressure, they didn’t check her temperature,” said Black. The County Administrator said that it is standard protocol and common sense — that's why all four were suspended. On Tuesday, July 31, each of them was given the opportunity to give a statement during the pre-disciplinary hearing. Lt. John “Mike" Morris was first, followed by Fire-Medic Justin Sweeney, Fire-Medic Andrew Martin, and the acting Lt. Cortney Barton. Nicole Black told ABC Action News she didn't plan on going to the hearing, "God is taking care of it," she said. Last week, Black sat with her lawyer and gave an account of what happened. She said on July 4, Galloway’s 7-year-old daughter called to say something was wrong with her mom. Black lives down the hall in the same condominium complex so she ran to the other condo and saw her daughter slumped over the tub. Immediately, she called 911 and described what she saw happening. 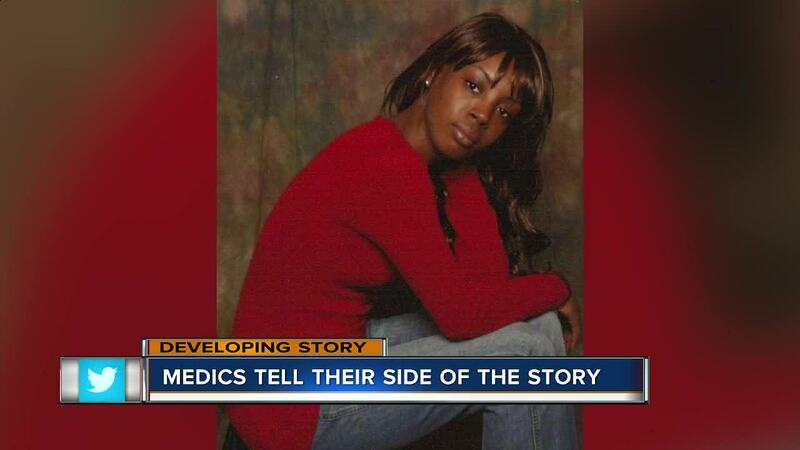 After deputies arrived, Black said they told her she couldn’t afford an ambulance ride. "They never asked us if we had insurance, which we do,” Black said. After fire medics got Galloway down the stairs, the County administrator said the group made their second mistake. They let Black drive Galloway to the hospital without signing a consent form. Black claims that the fire medics' came up with that idea. Galloway fell into a coma for days before she passed away at Tampa General Hospital. "She’s 30 years old just graduated from college she had her whole life ahead of her,” Black said about her daughter. "You can tell me you’re sorry, you can give me your condolences but you still have to work this out with God." Black would like to see all four fire medics fired because she said she feels as though she was stereotyped.